There are times I think the best blog posts are when you share your experiences, and others can identify with your walk with Jesus. I received the following email, and was struck with the courage and the obedience that this reader exhibited. I have received permission to share the following experience, and I hope the story inspires you, too. This morning I really struggled with going to a "church", and strongly felt like God guided me to this particular one. [But when] I walked in, it was like a club. Disco lights, fog machine, the drummer was in one of those platform cages that dancers are in at clubs. I struggled the entire time with the desire to get up and leave. There was a clock on the back wall that was a countdown until the service was over. Do you think God wants a countdown clock at His Church?? The sermon was against what I believe, and if I did believe it, I would be in a very bad place. Basically, they believe that when you are at your breaking point you should just wait and eventually Jesus will find you and rescue you. I disagree! Jesus never has to find you, and that's not His job. You should seek Him out! If I had waited for Him at my breaking point I would probably still be waiting. He's always there, you just have to find Him. The point is this was a BAD experience. So, at the end there was an altar call. By this point, I was just ready to leave. God spoke to me and told me to go pray over one of the prayer leaders. My response, "But God, this is not comfortable. I don't know her situation and she looks pretty confident up there. How am I supposed to just walk up there and pray for her?!" But I got up, walked down there, and grabbed her hands. I told her, "God told me you needed prayer", and I prayed with her, as He guided me. I have no idea what I said, but after a few minutes she was bawling and I felt like He was done, so I left. I have NO idea what her life is like and I will never know, but God used me to intervene. I think that is why I was sent to this terrible "church" and why He wouldn't let me leave. It's funny how you just never know why you're in a situation. I feel like most of my steps these days are for a purpose I will never understand. But it was pretty exciting to feel like He used me like He did. I feel like my relationship with Him is strengthening more and more every day. How many of you identify with this person? How many struggle with attending Church because you are not being fed? How many think you have to leave the Church to do His work? I can tell you that these are questions that I have asked myself, and I want to make sure you understand that I think the answers and solutions to these questions are different for every person, and the key to getting your answer is to listen to the Holy Spirit. For me and my husband, we clearly saw the Spirit leading us in a specific direction of spiritual warfare and deliverance. We wanted to share these revelations with the Church, but they weren't interested. So we were instructed to just go do these acts of service for the Kingdom, and He would bring people to us who needed Him. In the case of this person, they were instructed to go into the Church and stay for that one hour, with a specific purpose of reaching that one prayer leader. Then they were released to leave. Another person might hear they are to stay for years. 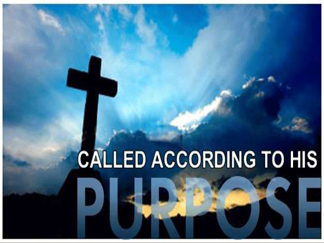 My point is, God has a specific purpose for each of us, and can use us in many different ways -- and in many different places -- to spread His Gospel of the Kingdom. He has different roles for us to play in the administration of His purposes, and different deeds He wants us to perform. We will each have different responsibilities and duties in our walk with Him. And what He has planned for me is probably not going to look like what He has in mind for you. But the one thing we should all have in common is the willingness to say, "Yes, Lord!" when we are called. It is fruitless to compare ourselves to each other and how He is using us -- and I mean that word "fruitless" in its most pure spiritual sense. We do not bare fruit for the Kingdom when we are too busy judging others whose journey with Christ doesn't look like the way we think it should -- which usually means it doesn't mirror our own walk. As far as I can tell, once Jesus had finished training up the Twelve Disciples and left them to carry on His work, they each walked a different path from the other Eleven. Yes, they had the advantage of seeing all the various ways that Jesus modeled how the Father wants us to administer His Kingdom on earth, so they weren't trying to conform to a "one-size-fits-all" framework. But isn't it time that we step outside of the cookie-cutter mold of what "a Christian walk" should look like, and celebrate the unique and extraordinary ways He can use each of us? I'd like to finish my commentary by saying that whatever situation we find ourselves in -- whether in the Church building; in a Home Church; in the line at the grocery story -- they are all opportunities to listen for the Holy Spirit's instruction, and then to be willing to act on it. We were commissioned to go out into the world, with no restrictions on where the Spirit might take us, or how He might use us. I pray that Christians will be more sensitive to experiencing the unexpected, the uncommon, and the unfamiliar. You might find it difficult to comprehend ... but Jesus is there, too. 1 Corinthians 3:8-9 "He who plants and he who waters are one [in importance and esteem, working toward the same purpose]; but each will receive his own reward according to his own labor. For we are God’s fellow workers [His servants working together]; you are God’s cultivated field [His garden, His vineyard], God’s building". Once again, the leading and guiding of His Spirit of Truth as He gives you the wisdom and direction He is taking your husband and you on this path beside the still, quiet waters. And once again, spot on with hearing the voice of His Spirit within you. Wow. God really knows how to cut through the vanity of thoughts I had and I responded with, ' of course I am here to worship You.' I spent the next several weeks going to 'church' there and wherever I sat down, everyone would get up and move away from me. I would lift my hands up, close my eyes and sing, praise and worship the king of kings and would walk out and go home. One Sunday as I was walking out by myself, a man came running up to me and caught me and said that this was his first time at that 'church' and he was so disillusioned with God and even questioned if He was real or not and he had sat behind me in the service (lots of empty space around me LOL ) and he told me that as He watched me praising God and worshipping Him He realized that God was real and he could go back home with more faith to believe Him for what was happening in his life then. He had come from a town about 20 miles away so did not know that he could not talk to me, The Sinner. Very shortly after that, God allowed me to leave there. I believe that your testimony echoes that of many whom God has called to stand out from the Body. Our experience has been similar, but not quite so obvious -- looked upon as divisive and with suspicious and cynical eyes and hearts, just because you don't "fit the mold". But what I love about these times of trial is that we are able to hear God and how He wants us to handle the situation... stay for a season because there is something He wants to do among those Unbelieving Believers -- and you may not ever know what it is. And then when you have accomplished His purpose, you hear in your spirit man that it's okay to move on. And we do so with love in our heart for those we leave, but also with prayerful supplication to the Father that they not be left in that state; that He has been able to somehow use our "different-ness" to prick the hearts of another to seek more of Him. I can honestly tell you that it is difficult to "shake the dust off of your feet" and move on. There is a sense that you have failed Him by being unable to impart Him in enough significance to change hearts and minds. But then comes the realization that only the Holy Spirit can do that... and you thank both the Spirit and the Son for doing a work in you, and pray that it will be received in those whom you knew. 1 Corinthians 4:9-14 says it all in Truth!